I hear it is important to have photos in the builder’s log of myself building the airplane, so Caroline volunteered to come down and take some pictures. 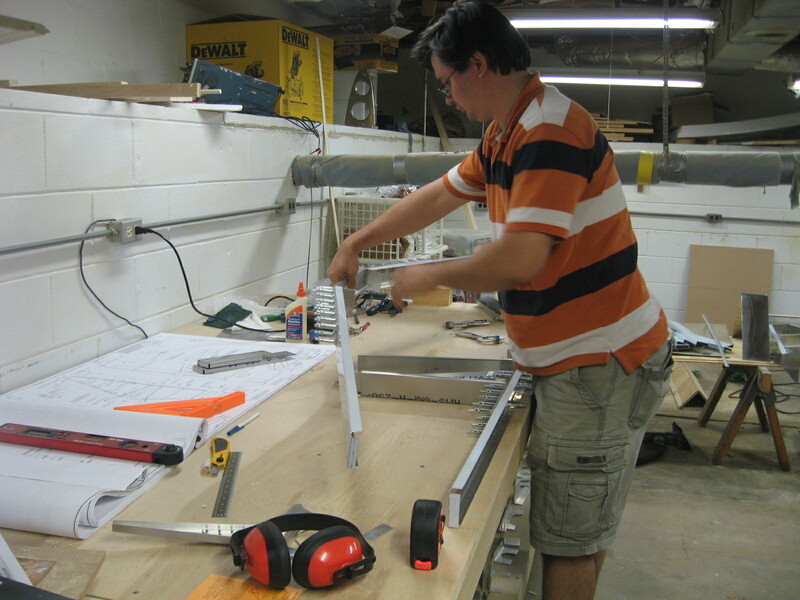 I drew an outline of the horizontal stabilizer on my workbench and here I am precisely positioning the forward spar. While we are at it, here is the vertical stabilizer. 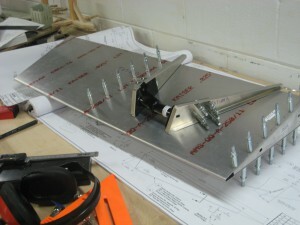 I am still trying to decide what to do about corrosion protection, so I have been too chicken to start riveting. I decided to start working on the elevators–I have been worried about how to cut the control surfaces with the tight bends. I ended up cutting within an inch or so of the line with the bandsaw since it is difficult to see how close to the line I am on the bottom side. Then I used offset Wiss snips to cut close to the line. The Andy snips seemed to big for this job except on some of the long cuts. I used my Dremel tool with an abrasive disk to cut through the bends. Then I used the scotch brite wheel to shape right to the line. 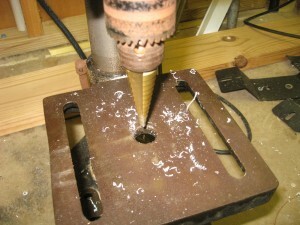 I started drilling pilot holes in my first piano hinge. Didn’t spend much time actually constructing anything on the airplane this week. The last part I was working on is the flap detent angle. This has notches where the flap handle rests at 0, 10, and 30 degrees. Other people have added a detent for 20 degrees so I decided to give it a try. 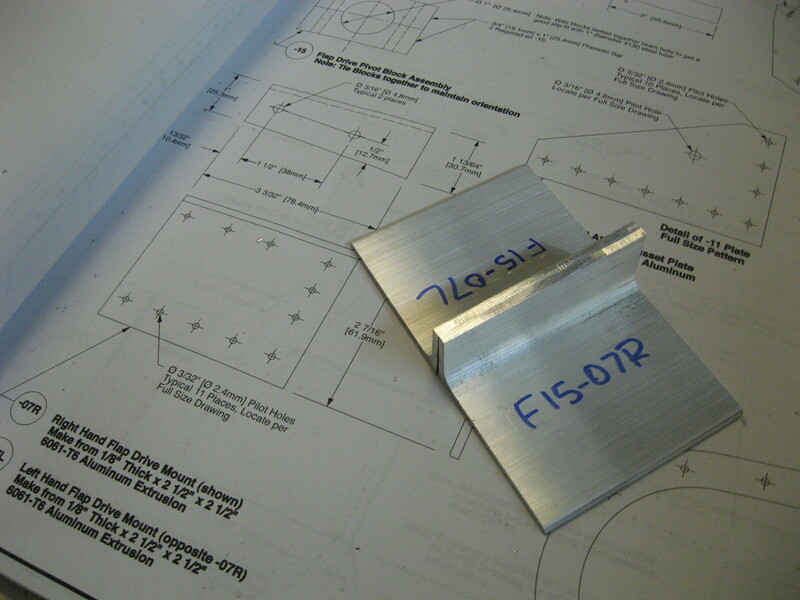 I spent far too much time researching other peoples’ designs and noticed some people added nibs to more than just the 30 degree detent as shown in the plans. 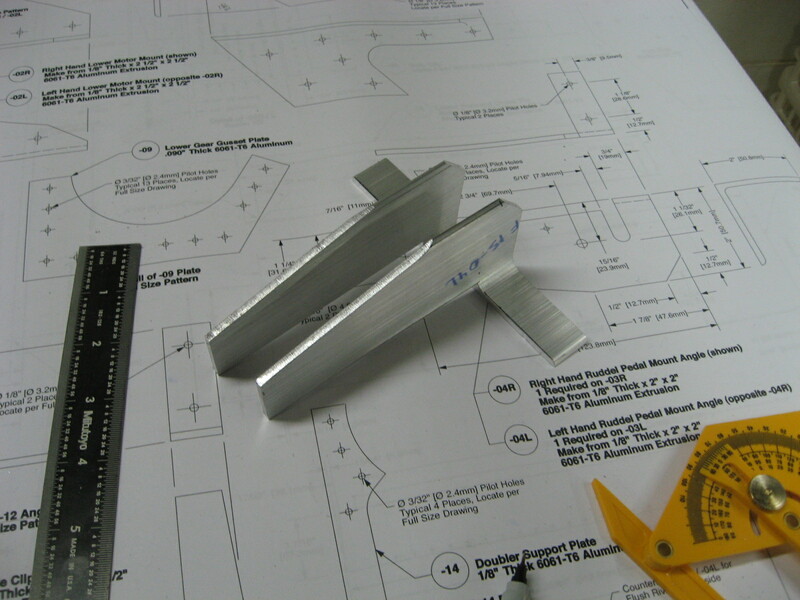 Then I noticed a couple people mentioning the flap handle getting stuck in flight and it seemed to be due to the flap lever bending within the detent and getting jammed in–easily solved by modifying the geometry of the detent. Needless to say I fantastically over-thought the part and decided to go even more extreme and draw it in CAD. I found SolveSpace, a simple parametric CAD program that is very intuitive, and drew my own version of the flap detent angle. Then I decided to cut it into aluminum on my wood-cutting CNC machine. I was trying 25ipm with .03″ passes and it was estimated to take about 20 minutes to cut. 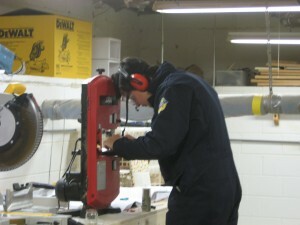 It was obvious I was cutting too fast–the tool was chattering like crazy so I quit and will cut it with the band saw. Was starting to feel worried I might end up with a build log without any pictures to prove that it was actually me building the airplane, so my wife helped me by taking some pictures. Here I am wearing a Los Angeles Sanitation jumpsuit in an effort to keep the house a sterile environment with no exposure to aluminum flecks. I also try to leave a set of old sneakers in the basement and take them off before coming up stairs. Seems to be working fairly well. There are a few things wrong with this picture. 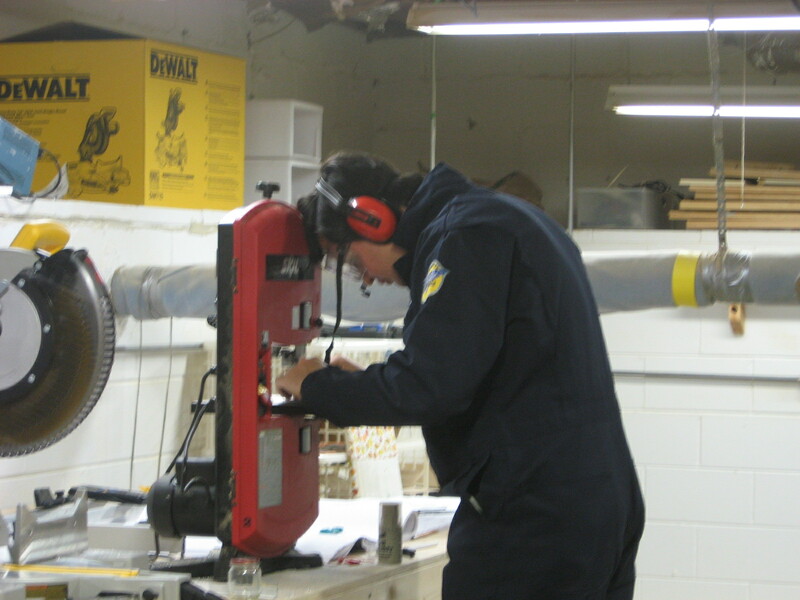 Yes, I am actually using my head to dampen vibration on my band saw. For some reason the top wheel has a fairly significant vibration that almost totally disappears once I touch my head to it. The band dangling from my eye protection needs to be trimmed or adjusted. I’m wearing my fancy ~ $3 Harbor Freight hearing protection–I decided when I finally get to fly the airplane I’d like to still be able to hear other pilots on the radio. I decided I better start wearing hearing protection so got some $3 earmuffs from Harbor Freight. While there I also got some step drills. I used the step drill to cut some small diameter circular cuts from some parts I was working on yesterday and they seemed to work well. 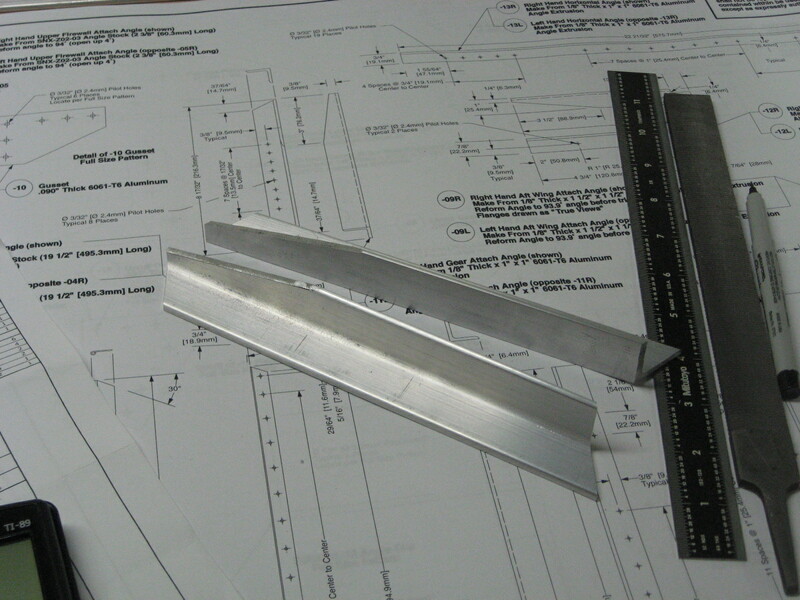 My current work flow is to find parts that don’t need to be bent that I have previously cut to approximate size and finish all the cuts. One of these days I might figure out how to do the bends and I will add that to my skill set. 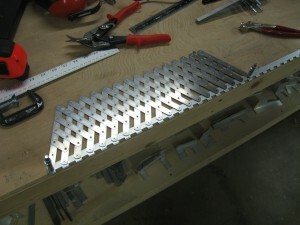 Snowmageddon 2011 hit and I was unable to buy a replacement blade for my band saw until today. 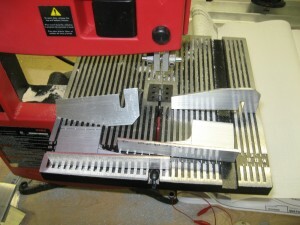 I bought the same metal cutting blade as before, but not without scouring the internet and a local machine shop. I was really tempted to get something really nice like a bimetal or carbide blade (these seem to be around $30 online). The local machine shop offered to weld a bimetal one for me for about $80–they aren’t really set up to do this for customers. I was too impatient to wait for an online order, so I settled with the Lowes one again. The new blade cuts just as good as before, but made an annoying clunking sound once per revolution. I traced this down to a piece of dull metal sticking out in front of the teeth at the weld–this was smashing into my aluminum once per revolution. I ground this off with my dremel tool and it was working great. 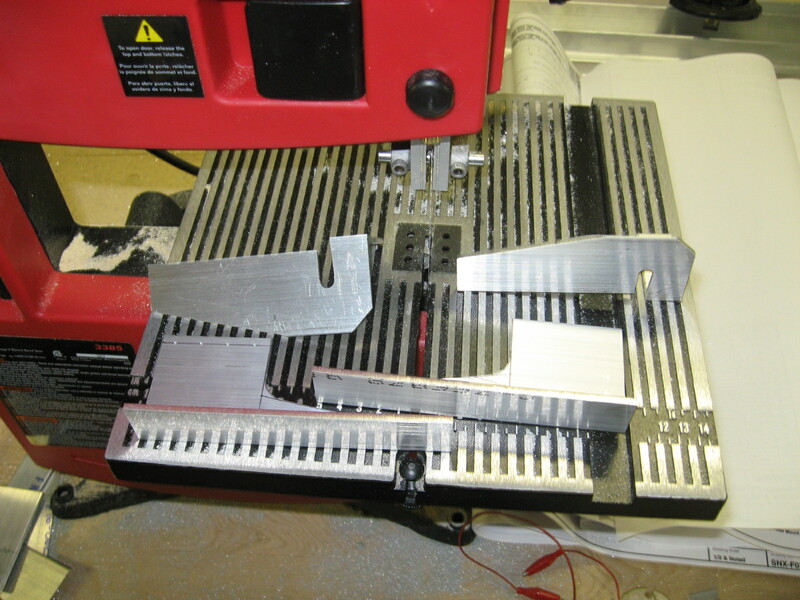 I started going back to parts I cut to size a week or so ago and finishing the more complicated cuts. 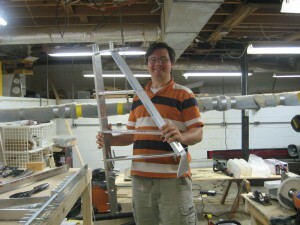 The curves were supposed to have a 1″ radius. I found a conveniently sized container with the same dimension and traced that. I need to figure out what everyone else uses for these types of cuts. 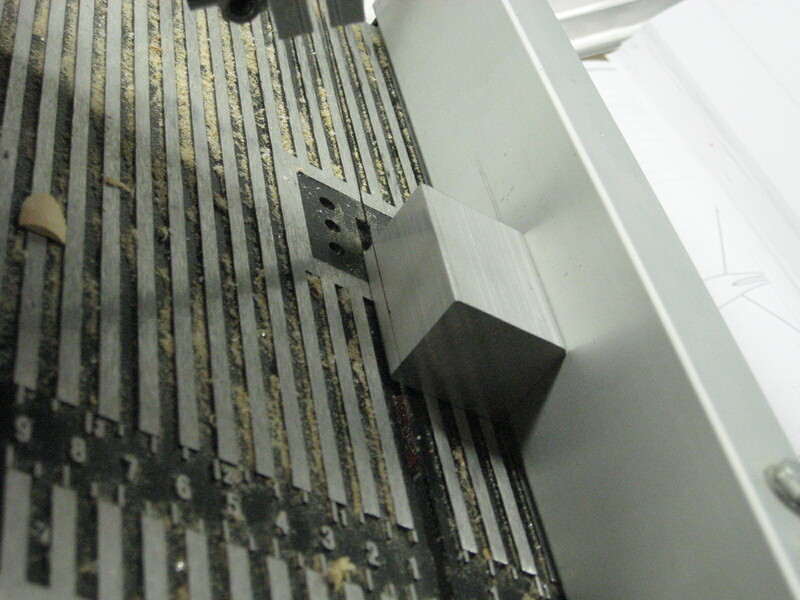 I did consider cutting out a bunch of circles on my CNC machine. Its fun after reading other peoples’ build logs to finally be building parts I have seen before. By the way, I have no clue how that yellow protractor thingy is supposed to help me. I probably need to see someone who knows what they are doing use it. These are now my longest band saw cuts. The cut started scaring me with banging sounds. 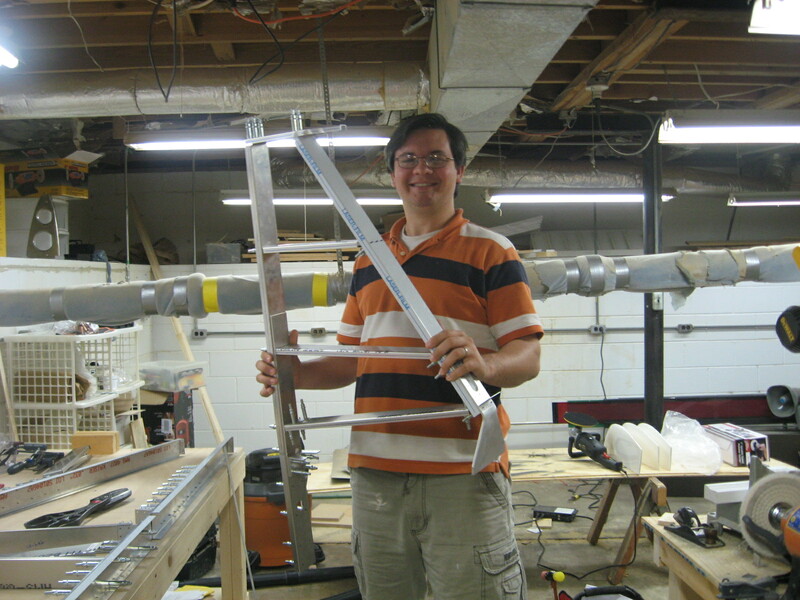 After I was done cutting I re-tensioned the blade and adjusted the blade tracking. The second cut had no scary sounds. I cut just on the outside edge of my sharpie line and was within a blade width the whole cut. These parts had a nice diagonal band saw cut. The first part I cut the wrong angle but fortunately I left too much material behind and was able to fix it. I was able to try out the vixen file on the cuts. The secret seems to be to be very gentle with it to keep the teeth from catching on the edge. 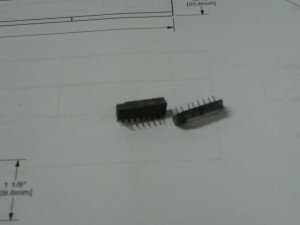 Its amazing how much material is removed with as delicate pressure as I can apply. Seems like I’ve had a pattern of developing a new skill each day. 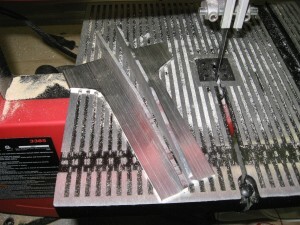 This seatbelt attach bracket was my first “long” cut on the bandsaw (hehe… I know much longer cuts are coming). I used the fence to get a straight cut. I’m starting to feel more comfortable making both mirrored parts. Did these cuts on the miter saw but will probably need to use the band saw for the rest. This part reminds me that I’ve been using a lot of trigonometry to calculate the cut angles–I guess most people use a protractor, but I don’t have one I feel is accurate enough. I can set the miter saw to a quarter of a degree with no interpolation. I mark the beginning and end of the cut on the part’s edges and I hit both marks each cut. I guess my calculator works (good thing I’m not stuck in radian mode). 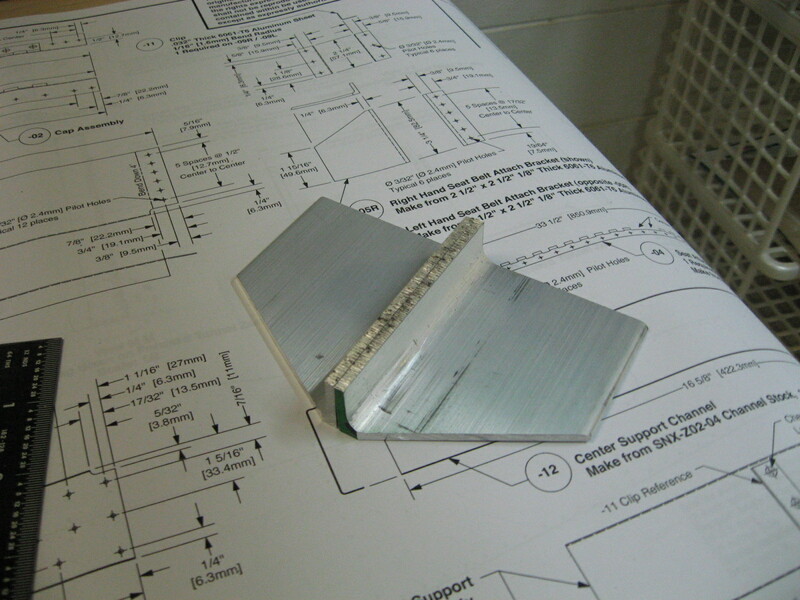 This was my first “miter” cut on the band saw. I had hoped to use the miter gauge to help cut at the right angle, but the geometry of getting the part to the blade while attached to the miter gauge wasn’t working so I decided to freehand it. 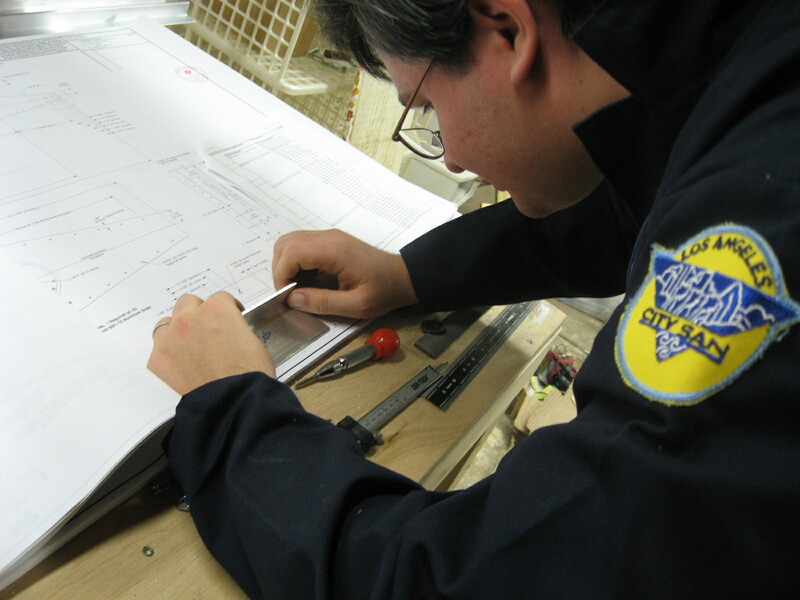 I drew the cut line and used the laser to help cut right down the line–I split the line in half on my first try. 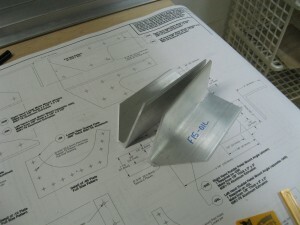 The second try wasn’t as good–I ended up off the line by a blade width, but some finishing should clear that up. Not sure if I like the laser–the reflection off the aluminum seems a little too bright. My parents got me a nice Dewalt 715 compound miter saw and a real aluminum-cutting 12″ 96 carbide tooth sawblade for Christmas. 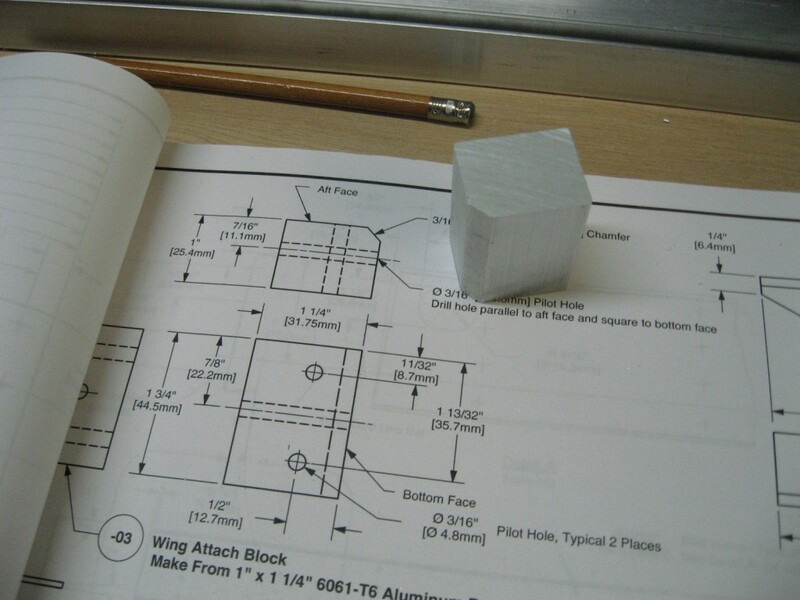 I decided to put this to use cutting the wing attach blocks which are cut from a 1″x1.25″ block of solid aluminum. I figure if the saw will cut this it will cut anything. 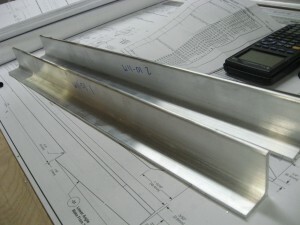 Also, there is a 3/16″ beveled edge that had been worrying me as I have not previously had much luck with my band saw (I was tempted to do this bevel with the compound miter saw, but could not think of a simple, safe, and accurate way of making the cut). 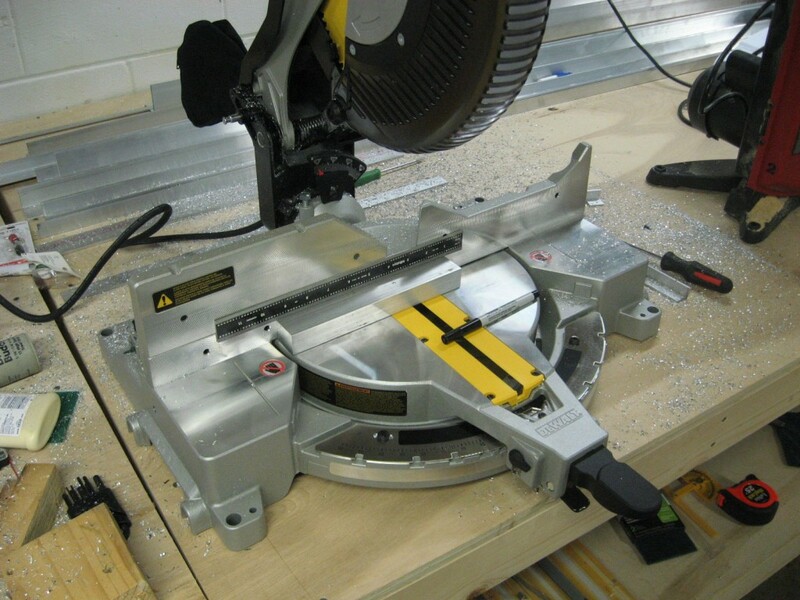 A lot of builders seem to recommend using a wood-cutting blade on the bandsaw to cut aluminum, but I couldn’t tell if this recommendation is just to save some money or is because a wood-cutting blade is actually desirable. My experience has been wood-cutting and metal-cutting blades are priced similarly at Lowes, but the selection of blades that fit my saw is small. The woodcutting blade I tried had a kerf that is about 10x wider than the actual metal of the blade and seemed to be gouging its way through the metal causing a ton of vibration, leaving a terribly ragged cut, and cutting much slower than I believe a blade with a smaller kerf would have. 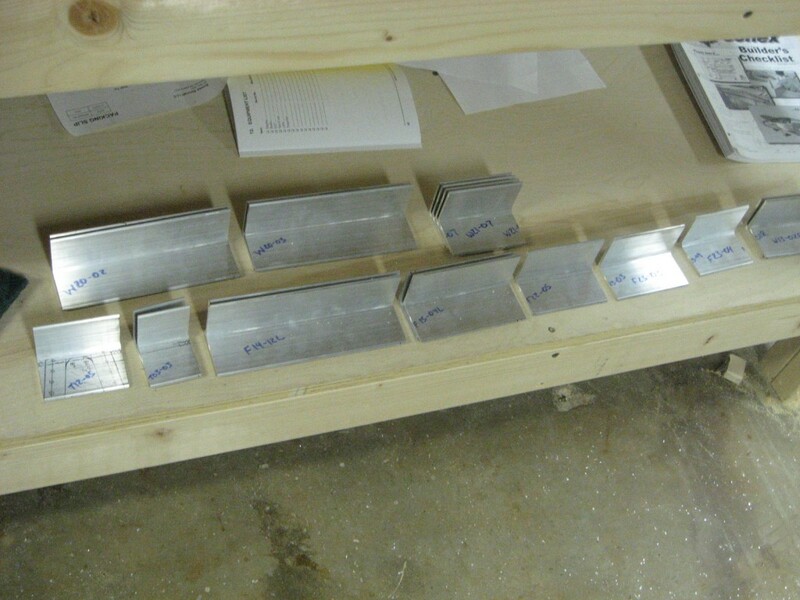 Unfortunately the kerf width is not labeled on the packaging, so you can only eyeball it. I decided to try a metal cutting blade and haven’t looked back since–the cuts have been fantastic. Here I have tilted the bandsaw table 45 degrees and set the fence for a 3/16 inch bevel. 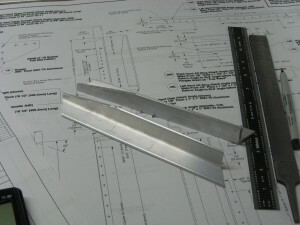 The desired cut path is drawn in using a black sharpie. The cut went great even though I was initially worried the blade might drift and there would be little I could do to correct for it with the fence in the way. 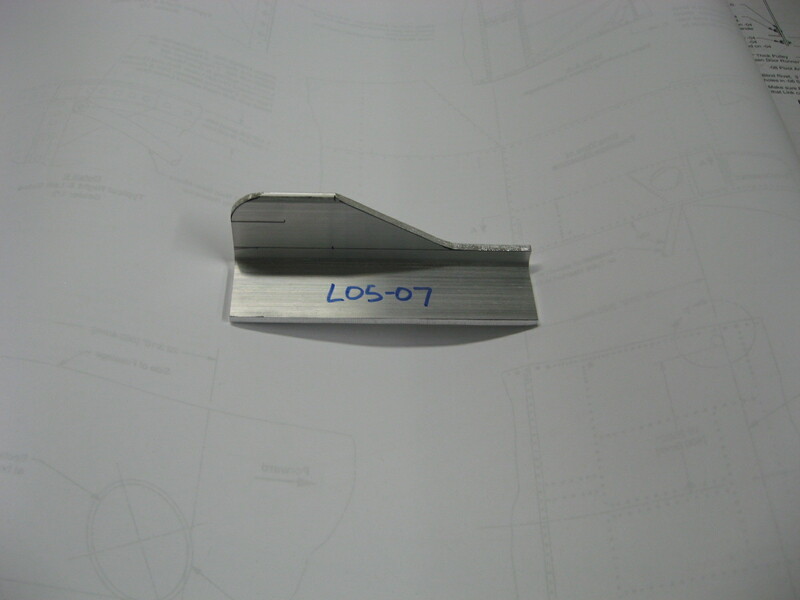 Here is a part after being cut to size on the miter saw and beveled with the bandsaw. Before making these exciting cuts I cut a bunch of aluminum angle to size for various parts.